I had the really fun opportunity to work with Andrew's McMeel again, on their 2017 "Women's Wit" calendar. It's a really fun mini-desk calendar with quirky quotes from inspiring women for everyday of the year. Like the 2016 calendar I illustrated, this project included cover art with hand-lettering and 6 spot illustrations and background for the interior. So great to work with Jenny and the Andrew's McMeel team again! I was thrilled to recently have the chance to create some cover lettering for an upcoming picture book from Random House. The book is based on the true story of Alice Paul, who led the women's voting movement in the 1910s. AD Katrina Damkoehler (also a very dear former colleague from my days at Penguin!) 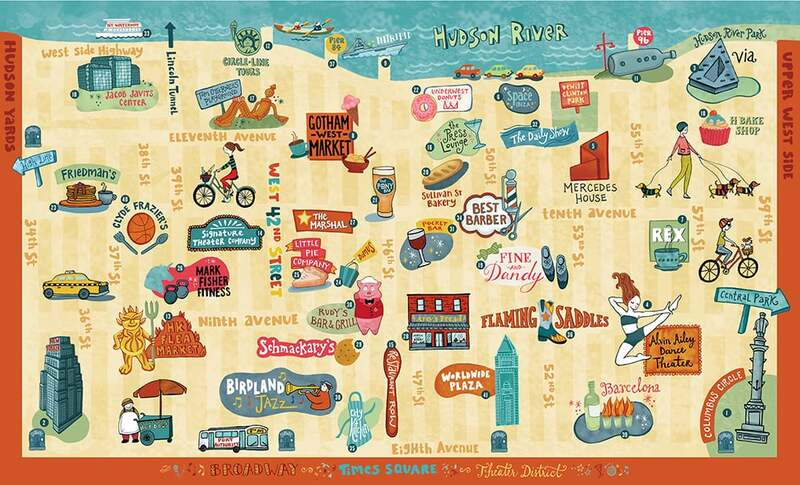 always has fantastic design ideas and steered me in a clear stylistic direction that worked well with the time period as well as the lovely art by illustrator, Nancy Zhang. She also asked me to hand-letter headlines for faux "newspapers" on the endpapers. This title will pub in the Fall (just in time for the election! ), but is available for pre-order now. Love how this came out and all works together as a package. Thanks Katrina! After having so much fun designing my own wedding invitations, seating cards & other details, I've been dying to do more! So I was thrilled when my friend, Lindsay, asked if I could help her with a few special touches for her big day. She had a gorgeous garden themed wedding at the elegant Winterthur Estate in Delaware, and her lovely invitations from Minted had a soft, simple look featuring calligraphy. So she wanted to reflect that in a few other details for the day of. Her first idea was to use a large mirror in place of programs at the ceremony. I hadn't seen this idea before, but loved the elegance and uniqueness of it! 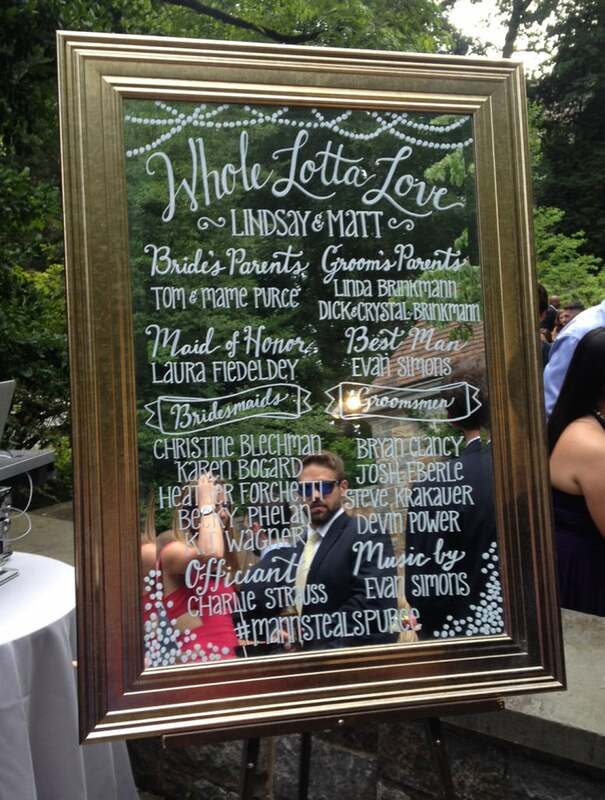 She purchased a 20" x 30" rectangular mirror and I hand-lettered all the bridal party names. This was definitely a new and fun experience for me to create—and I thought it looked lovely set up where guests arrived for the ceremony. I also did calligraphy for her seating cards and table numbers—I loved the way she presented them, as a small "flower bed"—it fit in so perfectly with the theme! I recently finished this cover illustration for the second book in the Stage Struck series for Sleeping Bear Press. This fun middle-grade series is closely based on the real-life experience of the author Anya Wallach, who began a summer theater "camp" in her parents' basement when she was just sixteen years old. Thanks to Jennifer at Sleeping Bear —always such a pleasure to work with! I was thrilled to be asked to illustrate Andrews McMeel's "Women's Wit" calendar for 2016, a mini desk calendar with sassy quotes from funny ladies for each day of the year. I created an illustration and hand-lettering for the cover, as well as 6 spot illustrations and a background pattern to be repeated throughout the interior. Here's the final approved artwork, as well as some of the initial sketches I submitted. This was SUCH a fun project—I can't wait to see the final product! Having just rung in 2015, I know it feels a bit early to be thinking about next year—but, they are available for pre-order now! My submission for Lilla Rogers' online "Make Art That Sells" Bootcamp course. The course specializes in assignments geared toward licensing markets, and this one was to create a journal cover inspired by Edwardian jewelry. Had lots of fun with this, and this design will soon be available on products in my Society6 shop! I've been sort of hibernating from social media for the last couple of months, but I have a good excuse (kind of!) ... I got married!!! Aside from packing in as many projects as possible these last few months so I can take some time off for a honeymoon, I (of course!) designed all the little touches for the wedding like my invites, programs, menus, etc. So it's been a little hard keeping up with sharing updates along the way, but the big day was last Friday so now I finally have a chance to catch my breath and share a few of the details! New York is a city I am in love with, and where I fell in love. I've lived here for over a decade, and my entire relationship with John unfolded here. This is where our story is, so we always knew this would have to be where we tie the knot! We got engaged last November 1st, so the timing just kind of naturally led us to have a Fall wedding (bonus that autumn in New York just happens to be my favorite!) I didn't really pick a "theme" for the wedding—after spending about 10 minutes on Pinterest I realized I just liked way too many different & unrelated ideas! But all the things I was drawn to had a simple elegance. And because we were having a city wedding with lots of guests who would be first-timers to NYC, I wanted to capture a sophisticated & classic New York-esque vibe overall. When it came time to make the invitations, I spent ages trying to decide what direction to go. The possibilities are endless, and I had WAY too much fun sketching out ideas! In the end, I decided these should also be type-based, drawing inspiration from art deco and art nouveau styles. The result was something, that to me, was a little reminiscent of old vaudeville posters —that perfect mix of fun & elegance I wanted. I also letterpressed these and I couldn't resist myself in the paper store, picking out pocket fold envelopes and patterned liner papers. I saw the Mad Lib RSVP idea somewhere in my inspiration search, and immediately knew I wanted to incorporate that. Everyone who knows me, knows my love for Mad Libs—plus, what a fun way to get our guests interacting with us from the start! I also hand-calligraphed all my envelopes, using gold gouache to give an extra special feel. The very first thing I knew I wanted for the look of the wedding was bright orange flowers—so I went the bold, complementary route and used a deep peacock teal as a secondary color. Gold became an accent color, and I used this palette throughout to tie everything together. I repeated some of the decorative elements I'd created for the save-the-date and invitations on the programs & menu cards. 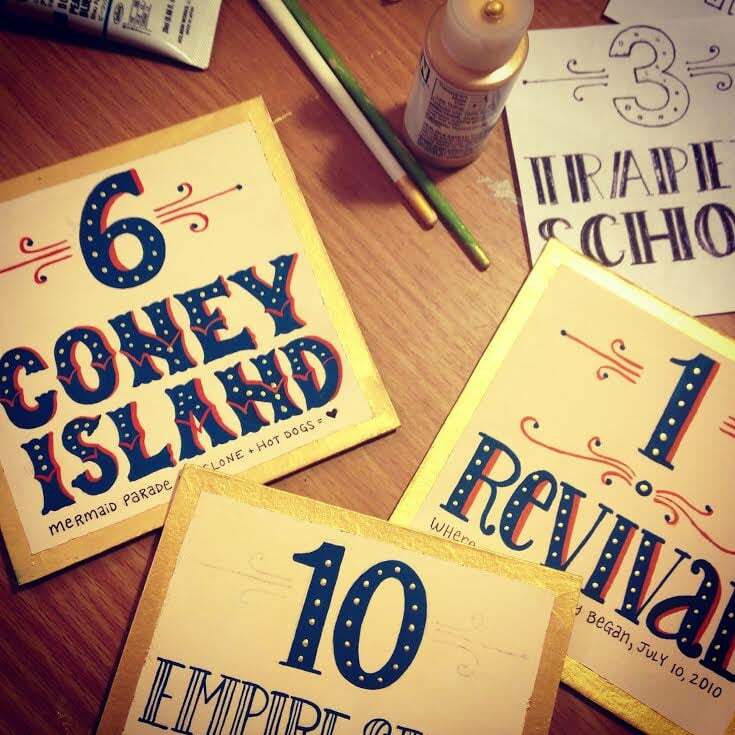 For table numbers, I wanted to use NYC places that had special meaning in our relationship—everything from where we met, to our first date, to our favorite pizza joint. I hand-painted signs on illustration board and used gold wire stands to group with our floating candle centerpieces. The place cards corresponded to the table number design. I used the lettering from my invitations to created a large vinyl cutout for the door. I'd hoped to get some fun photos in front of this, but my florist hung it very late and I actually ended up not even seeing it that day. But it seemed to be a touch that my guests liked, and was helpful in finding the otherwise unmarked entrance to the venue. Instead of favors, we made a donation to the American Cancer Society in honor of my father who passed away 8 years ago. We also had a photobooth—which I personally think makes the best take home momentos for guests! But, I did create totebags to welcome all my out-of-town guests as a thank you for coming to celebrate with us. I based the design off my save-the-dates, and had my best friend (and bridesmaid extraordinaire!) help me screenprint them. They were stuffed with goodies, a "hangover kit", and a few guides I designed to share the weekend itinerary and recommendations for getting around NYC. 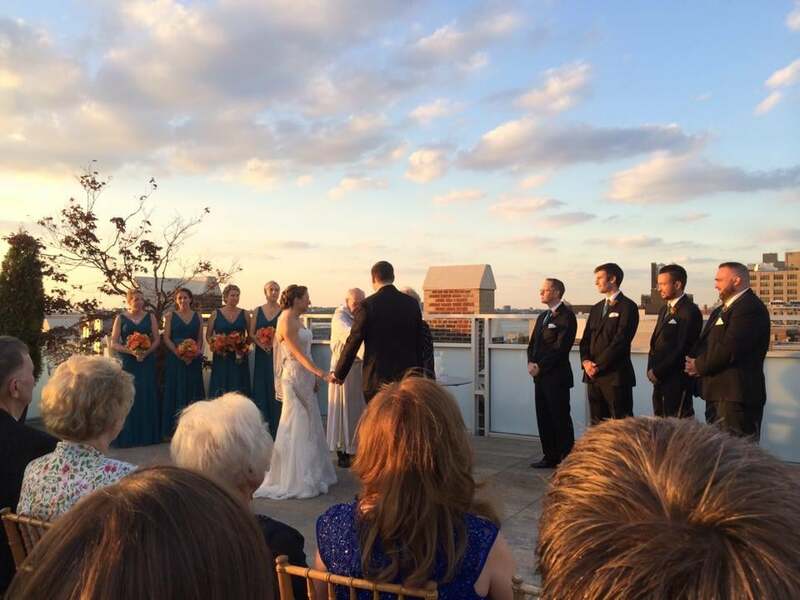 Our wedding was at the Tribeca Rooftop in downtown Manhattan, and we lucked out with the most gorgeous 70-degree fall day, with a stunning sunset. It was absolutely magical, and the party that followed wasn't too shabby either! It truly was the most amazing day of my life—and over flowing with love! 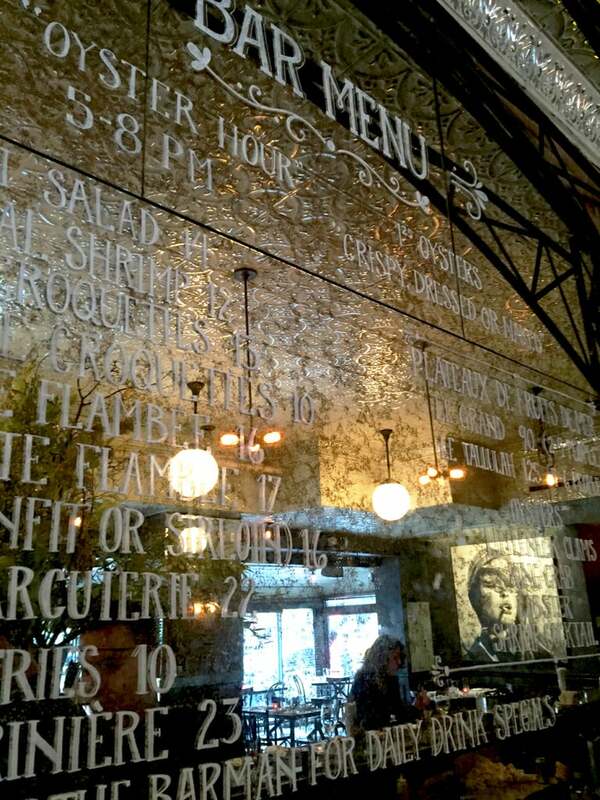 Here's a few snapshots from friends and family. I'll share some of the pro photos once I get them. The latest in my series of illustrations for Hershey's Bliss launched on their Facebook page this week. These “Blissisms”, or “truisms about life with a delicious chocolate twist”, are part of a social media campaign, and this is my third piece for the project. 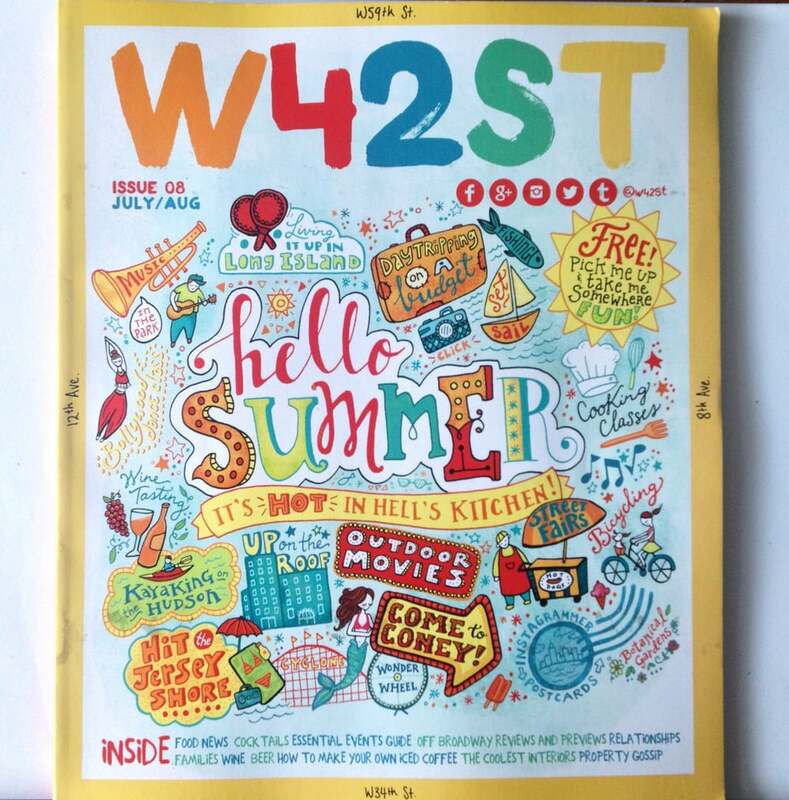 This was a perfect opportunity to marry my hand-lettering & illustration and the creative team at W2O Group was fantastic to work with, making this one of my favorite assignments. Plus...who doesn't love chocolate! You can stop by and "like" the image on their Facebook Page, as well as check out the other images that are part of the campaign. I created their Facebook cover image as well as another "Blissism" (here), and am in great company with the other illustrators commissioned to be part of this fun campaign.